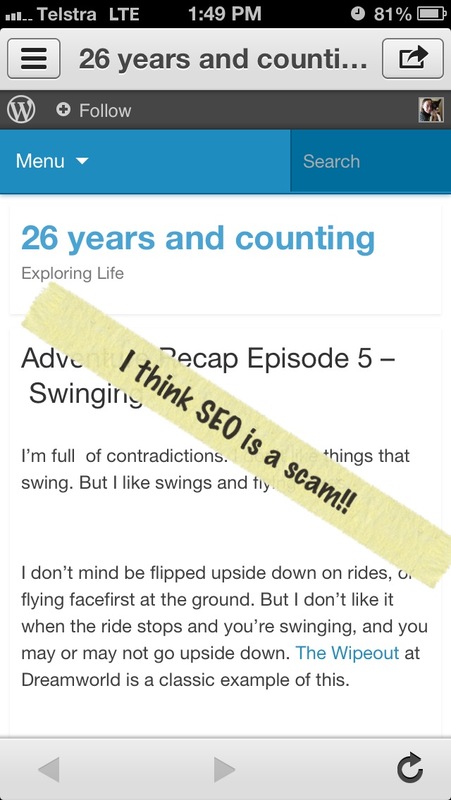 I view SEO as a giant scam. I don’t mean those comments that we all get on blogs about optimising our sites for only $300, to be paid to some bank account in some random country where you’ll never get in contact with the person again (though I’m quite sure they are scams). I mean the entire concept of SEO. Explain it to me if you don’t want me to think this way. Google have a search alogrithm that determines what shows up on their results pages. Google do not publicly release this algorithm. Therefore how can people claim to know how to make your website rank in Google? Yes, I understand there are tactics and educated guesses that surround this. But from what I’ve heard of these, as soon as people idenfity a tacic to make a website rank better, Google hear about it and penalise you if you use the tactic. Which brings me back to SEO being a scam. Or maybe scam is too much of a harsh word. Maybe just full of crap. I can’t be the only one who feels this way – recently I learned of a new search engine that is ‘advertised’ as SEO free – http://www.samuru.com/. I haven’t used it yet so I can’t say how good it is. Please feel free to explain to me what I’m missing here. Usually when I bring this up people get all self-defensive and throw their hands up in the air and tell me I just don’t get it. Something about me that applies to all topics, including this one: I ask questions because I want an answer. Many people assume I’m just joking or provking them when I ask a question like this one but 99% of the time it’s a genuine question & I would be interested in an answer. I love learning. What do you think about SEO? Do you spend time on it? Am I blindingly naive in thinking about SEO this way? Or do you agree?